You may have heard arthritis described as a “woman’s disease”. In this case, popular wisdom proves to be true: scientific research informs us that due to physiological and physical differences from men, women are more likely to get certain types of arthritis, such as lupus, rheumatoid arthritis, and osteoarthritis. Disturbingly, arthritis is the second most common chronic condition reported by women after back pain. According to the Public Health Agency of Canada’s 2010 report, “Life with Arthritis in Canada: A personal and public health challenge,” nearly two-thirds (64%) of those affected with arthritis in Canada are women. Click image to enlarge graph as a pdf. Women are affected in greater proportions than men by all types of arthritis, except for psoriatic arthritis, which occurs roughly the same in both genders, and gout and ankylosing spondylitis, both of which more commonly affect men. For example, 9 out of every 10 people with systemic lupus erythematosus (SLE), or lupus, are women. While the disease can strike at any age, it tends to happen most often between the ages of 15 and 45, which suggests a possible hormonal link. Being a woman seems to amplify the age-related increase in the occurrence of osteoarthritis (OA) in the hand, knee and in multiple joints. After the age of 50, the frequency of OA in these joints is significantly greater in women than in men while the frequency of hip OA increases at about the same rate with age in women and men. For rheumatoid arthritis, new research from the Mayo Clinic shows that after decades of decline, rheumatoid arthritis (RA) is on the rise among white women in the US. In RA, the inflammation causes pain, stiffness and, if left untreated or under treated, permanent bone damage that will cause joint deformity. The Mayo Clinic study also identified that there are many possible environmental factors that could be playing a role in the decline and subsequent current increase of RA among women. We will look at the reasons for the higher prevalence of arthritis among women in the “Why Women? Arthritis Risk Factors for Women” section later in this newsletter. Arthritis is the second most frequently mentioned condition as a cause of disability among men, but first among women. Because arthritis is more common in women than men, it is not surprising that women report more physical disability. However, the individual woman with arthritis will be more disabled than a man with arthritis. For example, in the Canadian workforce, women with arthritis are more likely than men with arthritis to report disability days for health related reasons. The greatest proportions were reported in the youngest age group (39% and 32% of women and men, respectively). Also, women are more likely to experience activity limitations due to arthritis compared to men. The proportions were higher in women of all age groups with the greatest difference observed between the ages of 55 and 74 years. Arthritis related disability includes limitations in mobility (i.e. moving around, reaching and bending and transportation), self-care, domestic life, major life areas, and community, social and civic life. Women with arthritis have significantly greater difficulty than men with climbing stairs, standing for twenty minutes, moving room-to-room or walking ½ km, reaching, and with grasping or carrying. Both men and women living with arthritis reported facing considerable difficulty in domestic life activities. But, differences between men and women were evident, as 1.8 times more women than men report difficulties. 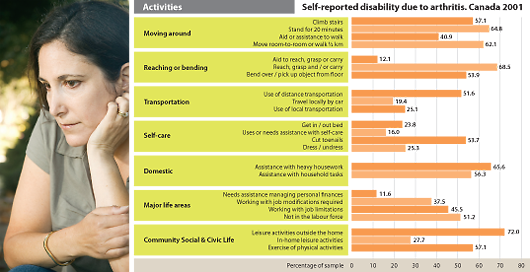 Young women (15-44 years) with arthritis reported similar or greater difficulties with heavy housework and needing assistance with household tasks than those reported by women aged 65 years and over with arthritis. The reasons for these differences between men and women are not completely understood. According to the “Life with arthritis in Canada” study, several factors, such as longer life expectancy, hormones and lifestyle differences, may explain the higher prevalence of arthritis among women. Research indicates that hormonal differences may be one reason why women’s joints are susceptible to injury. Estrogen is a key hormone, which makes women, women. Among other functions, estrogen protects cartilage in joints and increases production of its two important building blocks: collagen and proteoglycans. After menopause, there is a steep drop-off in a woman’s protective estrogen level, leaving joints deprived of these strengthening molecules. Day-to-day stress on the knee, along with repeated bumps and bruises can now make joints prone to long-term damage and osteoarthritis. Growth factors promote tissue regrowth and are important in repairing the damage that occurs from daily activities. Scientific research indicates that levels of growth factors are significantly decreased in women with severe osteoarthritis. Women thus have a lower ability to repair soft tissue damage and end up with more severe cartilage damage. The 2010 Mayo Clinic study found that a contributing environmental factor for rheumatoid arthritis (RA) could include the changing composition of oral contraceptives. The pill has been shown to protect women against RA. However, because the oral contraceptives of today contain far less estrogen than they used to, they may be less protective. Vitamin D deficiency, which has been linked to RA, is another possibility, the researchers say. Deficiency in this nutrient has been on the rise in recent years, particularly among women. Researchers suggest that during athletic activities, women tend to favour their quadriceps muscles in the front of the thigh to stabilize the knee, instead of the stronger hamstring and gluteal muscles that support the back of the thigh. Especially during strenuous activities, this over reliance on the quadriceps, strains knee ligaments (fibrous bands connecting bones) leaving them more vulnerable to injury and tearing. Not surprisingly, compared to male athletes, female athletes are at a two to ten times greater risk of injuring their anterior cruciate ligament (ACL) – an important tissue band that controls knee joint motion. With a torn ACL, the knee can become unstable during day-to-day activities and lead to a much higher risk of osteoarthritis. Anatomical differences in women’s hips and knees may also explain the increased severity of osteoarthritis in women. Women tend to have wider hips, so the femur (thighbone) reaches the knee at a larger angle (called the Q-angle) than in men. Thus, parts of the quadriceps muscles, which extend the knee, tend to pull the kneecap away from the centerline of the body, leading to wear of the kneecap and pain during climbing stairs. Other bone-related differences in women may be a factor. For example, the femur is narrower and the kneecap (patella) is thinner in women, and more prone to cartilage wear and tear. There are a number of safe and effective ways women can prevent or delay the effects of arthritis. These consist of improving joint flexibility with exercises such as yoga or Pilates, increasing physical exercise and losing excess weight. These have been shown to decrease arthritis pain and lessen associated disability. Medical treatment of osteoarthritis typically includes taking effective medications and doing muscle strengthening exercises. Dietary supplements may also be effective. If arthritis continues to be disabling, the last option is surgical replacement of affected joints. As a society, we don’t have to give in to the fact that arthritis is a woman’s disease. We can fight against it. One of the pillars of the Arthritis is cured! (if you want it) National Arthritis Awareness Program (arthritisiscured.org) is to mobilize our arthritis community and take the arthritis story directly to the public. In the past two years of the National Arthritis Awareness Program, women in particular have been prominent supporters volunteering their time to promote arthritis awareness. To move toward lessening the tremendous burden of arthritis on Canadian women, it is necessary to continue to research the causes of arthritis and find out why certain types afflict women and not men, or men and not women. Our goal as a society should be to have the importance of arthritis be recognized in much the same way as breast cancer is today. As we continue to learn about the effects of specific hormones, anatomy and lifestyle on women’s arthritis, more targeted treatments and therapies can be used to improve the lives of our mothers, partners and daughters. 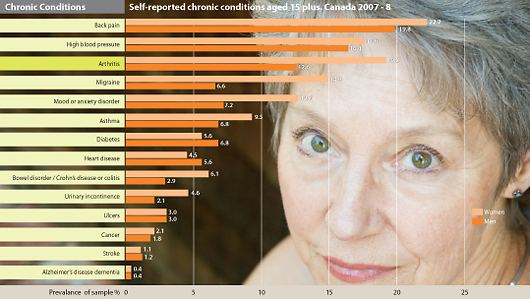 *Source for graphs and quotes: 2010 Life with Arthritis in Canada: A personal and public health challenge.